How many of your remember playing house when you were growing up ? I remember the house next door had an old shed that wasn’t used. Many of the kids in our neighborhood turned that into a playhouse. It had a dirt floor and I remember dragging an old car seat ( not kids car seats ! We didn’t have those back then ! I REAL CAR SEAT ) into the old shed. We used trash for dishes. It is amazing that none of use ever got sick from pretend eating off the trash we found and up cycled. Make believe or pretend play is not only one of the greatest joys of childhood it also offers abundant opportunities for children’s development . Children develop interpersonal skills , particularly cooperation and conflict resolution, They also improve their language and problem solving abilities in pretend play. When children are 2 they begin to pretend to cry, sleep and eat. Eventually throughout that year they add stuffed animals to that play. They will put their bear to sleep or feed a stuffed cat. They also take normal materials and begin to turn them into other things . A 2 year old may change a block into a pretend banana and eat it or a magnifying glass into a microphone. As children get closer to three years old they begin pretend play with other children. Dramatic play becomes more elaborate and the contract themes. 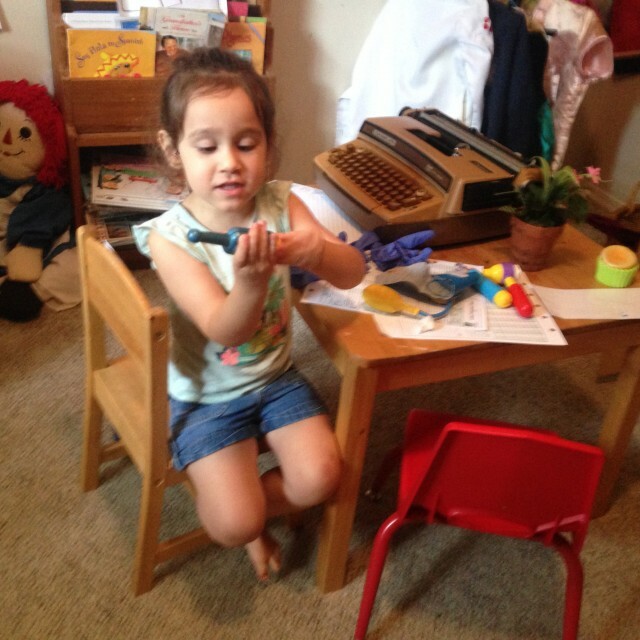 Four and five year olds start to mimic life circumstances more. ” You be the momma and Ill be the daddy. ” Sometimes during dramatic play you might hear a child working out things he has heard and seen mom and dad do at home. 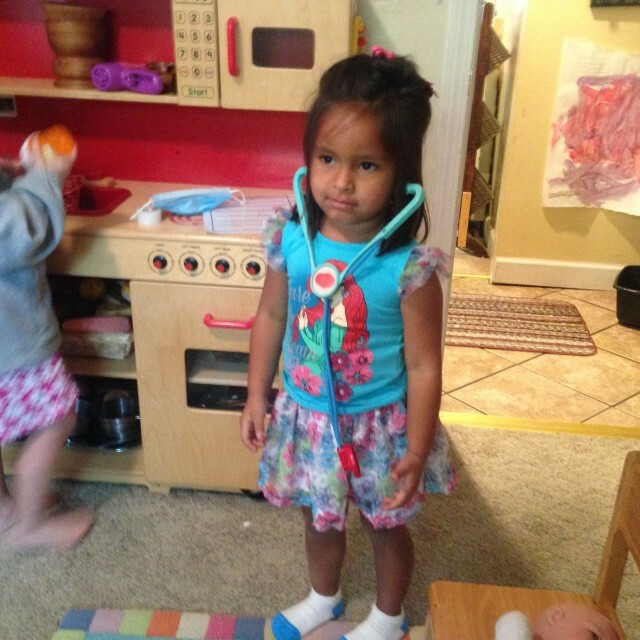 Dramatic play also increases language , especially language that fosters emotional development. In pretend play they can work through fears and anger in a safe environment. Parents can actively encourage dramatic play at home by concentrating on what their child’s interest is at the time. We can pay attention to the movies they watch and talk about and other things you see them interested in and provide props to extend that interest. EX. Your child watches a show about a little boy that had a pet dog. He loves it. The dog does tricks. You might add a stuffed dog for the child to play with. Since we have been talking about our bodies and had a nurse come visit we decided to extend that play and discussion to dramatic play. Most of our normal material stay in the room and accessible, we just move them around. 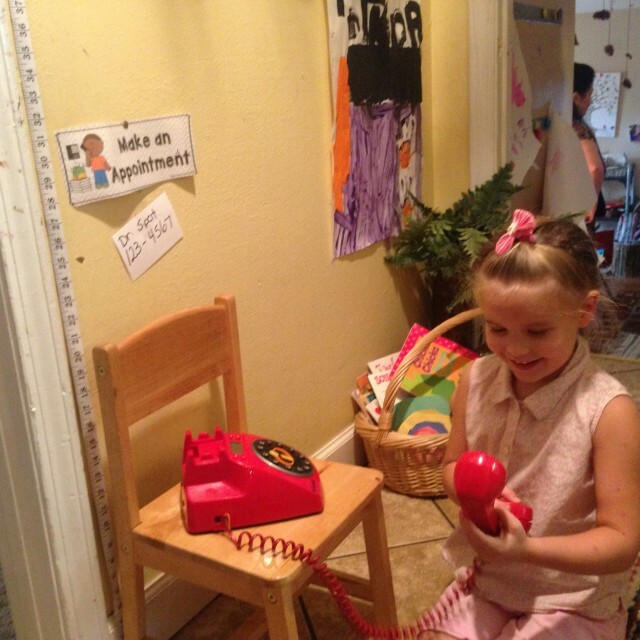 Quality preschool environments will have prop boxes with themes for pretend play. 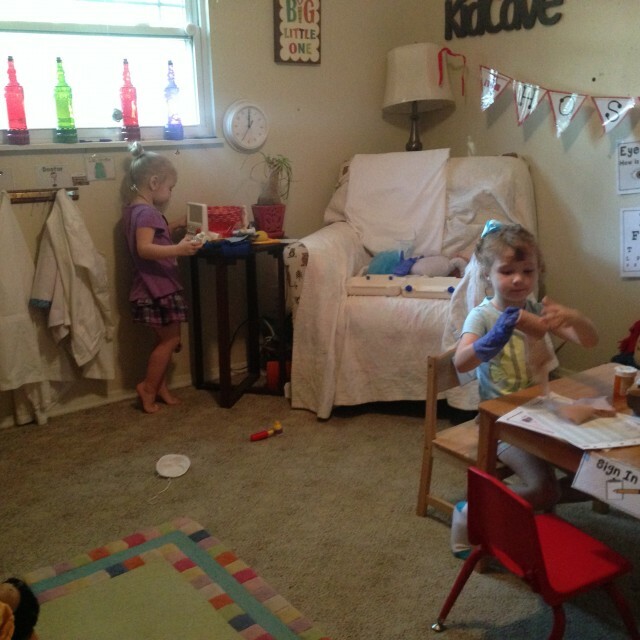 Last night I transformed our dress up area into a doctors office. We added a sign in area , a waiting area, lab coats and many other things. Today was a learning day. Children were invited in four at a time to explore the new materials . We will leave these materials out for a few days. Tomorrow Ms Dallas ( Who mainly plays upstairs ) will listen for conversation and try to expand their language intentionally. When she hears a child say live me give you a shot. She might say ” Oh, you are going to give an immunization ?” She might catch a lull in the play and ask some open ended questions like ” Can you tell me about a time you went to the doctor ?” The opportunities for learning are abundant.